The story of the breakup of an 18-year marriage, as seen from the points of view of both the husband and the wife. Fran walks into a piano bar for pizza. She comes back home with Joe, the piano player. Joe plans on winning $5,000 and leaving Las Vegas. Fran waits for something else. Meanwhile, he moves in with her. Dr. Emily Loomis: The first thing I'm going to teach you is how to work... and then I'm going to work you until you drop! When this aired in 1978, I approached with dread. 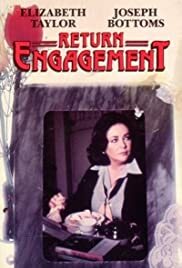 Taylor was terribly overweight (as a fan, I preferred not to see her so swollen) and what I knew of the plot of "Return Engagement" made me shudder--a history professor with a corny vaudeville showbiz past? Imagine my surprise when this turned out to be so poignant, with Elizabeth Taylor completely convincing in her role! Something in this screenplay must have touched her--a lonely woman who has escaped her glamorous past, reminded of it by one of her students (Joe Bottoms) who essentially forces her out of the closet of her guarded, careful lifestyle. Elizabeth had given a similarly fine-grained performance in "A Little Night Music" (let's just skip her singing, okay?) as an actress looking for a way out of that unsatisfying existence. So perhaps the theme of escape and/or renewal appealed to her. (She was married to John Warner at the time, and had "semi-retired" to act the role of a political spouse, but her image remained larger than life. Eventually she returned to being "Elizabeth Taylor.") This is without a doubt one of the many curiosities of Elizabeth Taylor's career, and one of the most satisfying. Be prepared, she is plump. Beyond plump, really. But her hairstyle and clothes are suitable and flattering. If you are a Taylor fan--and I assume you'd have to be, to be looking up anything on this movie!--it is worth searching out ebay or Amazon for an old VHS copy.